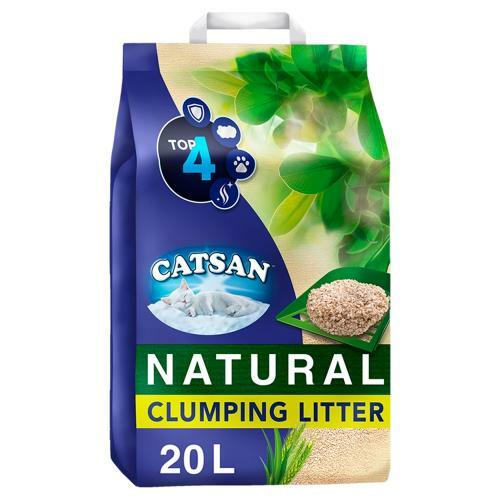 The Catsan Natural Biodegradable Clumping Cat Litter is highly absorbent litter that quickly forms easily removable clumps, making emptying litter trays that bit easier. Catsan Natural Biodegradable Clumping Cat Litte ris a safe way to care for your cat's intimate needs. Made from a wheat by-product that would otherwise go to waste, Catsan cat litter pellets are 100% natural and biodegradable without compromising on odour control. The solid pet litter clumps it forms and its pleasant natural scent are perfect for locking in odours. The raw material used in this natural cat litter is an agricultural by-product that is upcycled to become cat litter pellets. You can be sure Catsan Natural recycled cat litter is derived from a sustainable raw material as it grows back again and again every year.